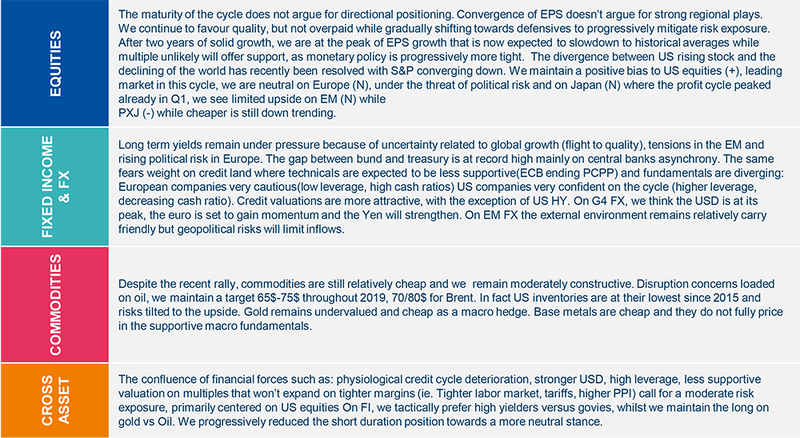 Global Equity – Cyclical climax! The confluence of financial forces such as: physiological credit cycle deterioration, stronger USD, high leverage, less supportive valuation on multiples that won’t expand on tighter margins (i.e. tighter labour market, tariffs, higher PPI) call for financial risk to dominate economic risk. 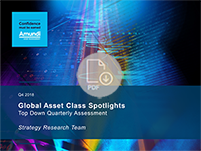 For these reasons, we identified some trackers of potential market turnaround: global liquidity and credit spread to track financial and financing conditions, EPS revision and momentum to take the temperature on profit cycle and risk adjusted valuation gaps. It is challenging to forecast the timing of the next turnaround and it is worth monitoring when we think this will occur. 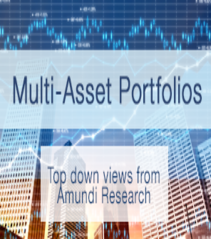 At this stage, the best strategy is to remain cautious with a modest OW to equity, preferably US, altering the composition of the portfolio towards defensive sectors and quality names. We are maintaining a short duration bias and have progressively reduced credit exposure. US and Europe FCIs reflect movements in several financial assets ranging from Money Market, short and long term interest rates, credit spreads and equities’ realized and implied volatilities. A reading below zero means financial conditions are tightening. TW$ broad (50% EM) proxies global liquidity. Historically, huge appreciations have been accompanied by equity market corrections. Long-term yields remain under pressure because of uncertainty related to global growth (flight to quality). Investors are worried about (1) the impact of a trade war on growth, (2) tensions on emerging currencies and (3) the rise in political risk in Europe. Greater confidence in growth projections and lower political risk are the catalysts needed for a rise in long term rates. Record US-German bond yield gap on CBs’ asynchrony. In the US, the normalisation of monetary policy is well under way while in the eurozone it is turning out slower than expected. 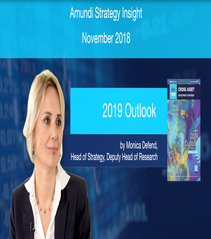 The ECB announced the end of QE in 2018 but communicated a dovish outlook on interest rates. Key interest rates are expected to remain at their present levels at least until the summer of 2019. A gradual increase in long-term yields is in line with our growth scenario in developed economies. 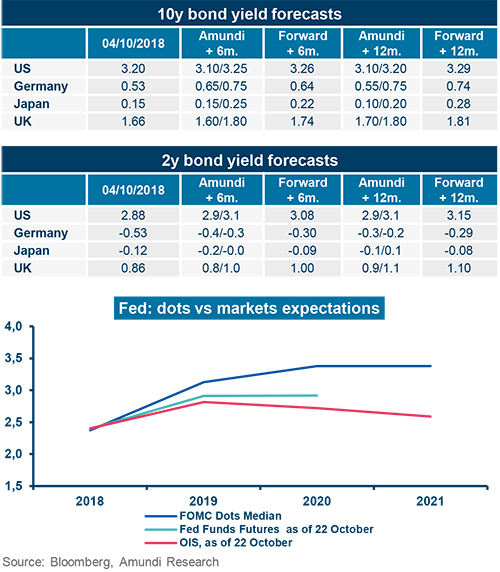 In H1 2019, we expect US bond yields to stabilise/increase slightly, while in H2 2019 we expect some pressure on the back of the slowdown of US growth and Fed finally coming to a pause. FED: we’re expecting the FED to deliver one additional rate hike in December, and two hikes in 2019, in line with market expectations. The market remains far from the dots in 2020. ECB: the ECB reiterated its forward guidance: “interest rates to remain at their present levels at least through the summer of 2019”. The markets point to no rate hike until the first quarter of 2020 and to a prolonged period of reinvestments. The minutes of the last meeting show that, despite the positive growth outlook, risk to activity is tilted to the downside. BoE: against such a difficult political backdrop, the BoE pledged to continue with “an ongoing tightening of monetary conditions” at a gentle pace. We do not expect any other interest rate hike in 2018, as no rush in further hikes has been underlined and Brexit negotiations are entering a critical period. BoJ: kept its monetary policy unchanged, and introduced more flexibility in its asset purchasing programme (upper limit of fluctuation on the JGB increased from 0.10% to 0.20%). Consensus has become more dovish about QE exit, not only on FWD rate guidance but also on reinvestment period, expected now to last 3 years. The minutes of the last meeting show that downside risk is currently the major one on the radar screen, “with risks relating to rising protectionism, vulnerabilities in emerging markets and financial market volatility having gained more prominence recently”. Some representatives of the ECB recently suggested that a wait and see attitude until the beginning of 2019 could be best, in order to better assess if and how risks may impact communication on eventual changes in implementing QE exit. The risk scenario is getting stronger. Global growth remains strong. Investors are worried about (1) the impact of a trade war on growth, inflation or exchange rates, (2) tensions on emerging currencies and (3) the rise in political risk in Europe. Technicals are expected to be less supportive in the coming quarters. The ECB will end the corporate bond purchase programme this year. The ECB will reinvest maturing debt but reinvestment amounts will not be significant before 2020/2021 (unless a switch from govies occurs). Demand/supply balance is relatively neutral, supported by lower primary market activity. Diverging fundamentals. European companies continue to be very cautious: low leverage, high cash ratios. US companies continue to remain very confident in the economic cycle: increase in leverage, decrease in cash ratio. Record amount of share buybacks and M&A operations. Valuations are now more attractive, with the exception of US HY. 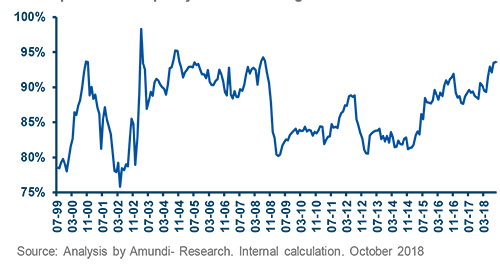 In the Euro credit market, despite better valuations, we moved to a tactical neutral stance on EUR credit market, on uncertainties about Italian politics and budget law. In the US credit market, we prefer well-rated issuers. We remain cautious on US HY. The essential: Central banks’ ongoing policy normalisation, trade tensions and political issues will be the key drivers to watch in the FX market. Brexit and political noise in the Eurozone might weigh on GBP and EUR for some time. We expect the USD to remain strong in the short term, and weaken with a medium term horizon. EUR/USD: Short term headwinds, more positive medium term outlook. Diverging financial conditions with respect to the US, concerns over the impact of a trade war on European exports, rising political risks will keep on weighing on the EUR in the short term. With the negatives that seem to already be priced in, with ECB expected to normaliseand increase rates in H2 next year and with very supportive external sector, we remain EUR bullish in the medium term. USD/JPY: downward trend for the year ahead. While in the short term the currency might keep on trading around current levels, we expect the JPY to be subject to upward pressure in 2019 especially driven by monetary policy, persistent trade protectionism talks and extremely cheap valuations. In addition to that, the JPY will tend to appreciate further on the back of rising US bond volatility, and due to the second effect caused by position rebalancing and capital repatriation back in Japan. GBP/USD: it’s all about politics. 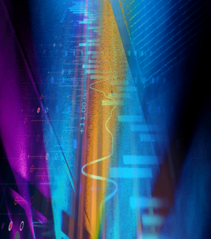 As many uncertainties remain over the future of the British economy, we expect currency volatility to remain high in the short/middle run and the potential upside to be limited. We believe a Brexit deal will be reached but the path to it will be rocky. 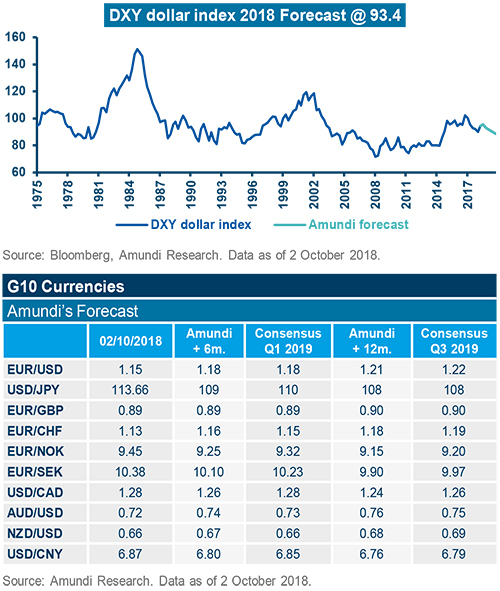 When looking at fundamentals, the USD seems overvalued against the entire G10 universe, thus pointing to further downside risks going towards 2019. Higher US bond volatility puts some upward pressures on JPY. Convergence (though mild) in monetary policy, repatriation issues and persistent protectionism talks are the other drivers. European political risks (with Italy at the forefront) are causing financial conditions to diverge from the US and this is putting a cap on EURUSD potential upside. Options market participants are still betting on a strong USD in the short term (3M), especially against EUR and GBP – Brexit related uncertainties remain the big question mark. 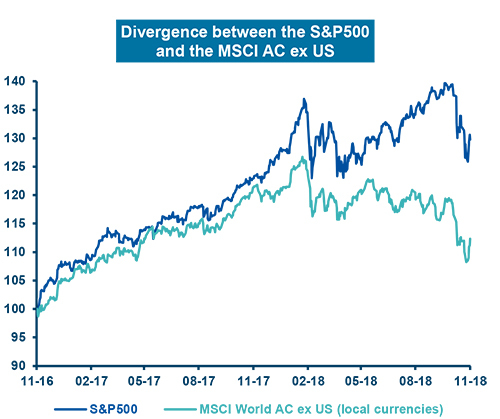 The 2018 divergence between rising US stocks and the declining rest of the world was finally resolved by a downward convergence. Historically, two macro factors are key to endorsing a lasting reversal in favour of defensive stocks. The rate factor, largely led by the US and which remains pro-cyclical at the moment, and the industrial raw material factor, largely under China's influence since the 2000s. 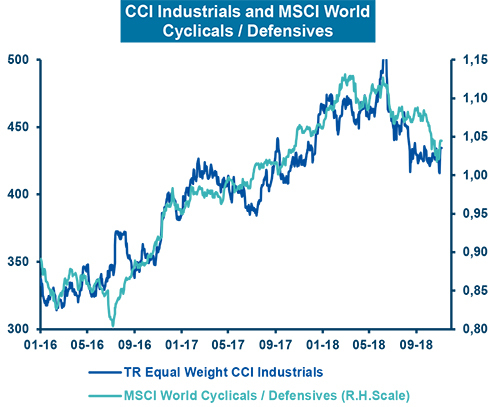 The cyclicals/defensives ratio clearly followed this second factor on the downside, indicating the prevalence of risk on global growth. The 12-month trailing P/E eventually consolidated sharply (from 22x to 18x) thanks to strong EPS growth in 2018 and a just positive performance YTD. But the relative forward PER is rich. The strong rise of EPS in 2018 (+23% due to tax reform and share buybacks) will be a one-off. Ibes EPS forecast of 10% for 2019 will be revised downward given the expected slowdown of the economy (see the strong link between ISM New orders and the Net up). But EPS growth is due to remain above the MSCI World. The S&P 500 has come back towards its rising 200-day moving average which is still on an uptrend. 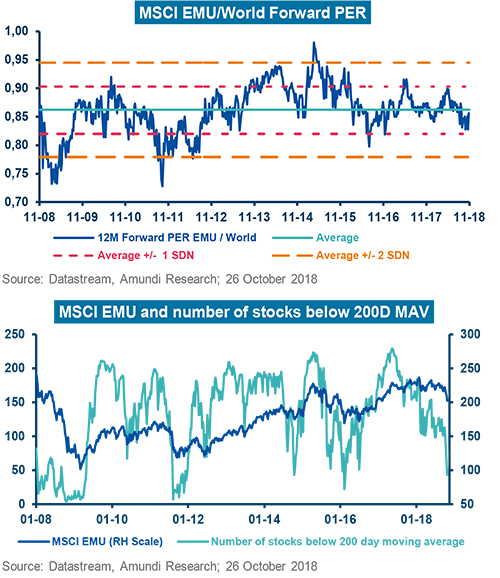 Relative to the MSCI World, it presents some short term excess. With a relative P/E one standard deviation below its average, valuation looks attractive but the political situation (Brexit) warrants a risk premium. EPS growth is fading from a peak in 2017 to 10% in 2018 and 8% in 2019 according to Ibes. 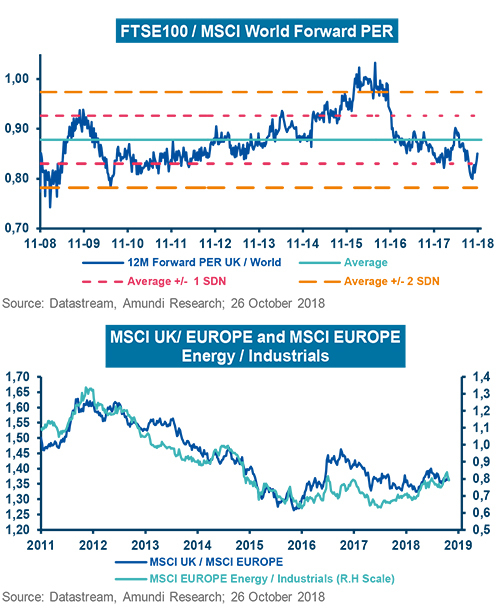 This typical late cycle play - proxy of Energy/Industrials and high DY (4.7%) – could eventually suffer from a rising GBP, should a deal be reached on Brexit (Amundi core scenario). The setback of the relative PER is due both to the underperformance of the index and the earnings. The political risk (Italian budget, Brexit, EU elections) requires a risk premium. 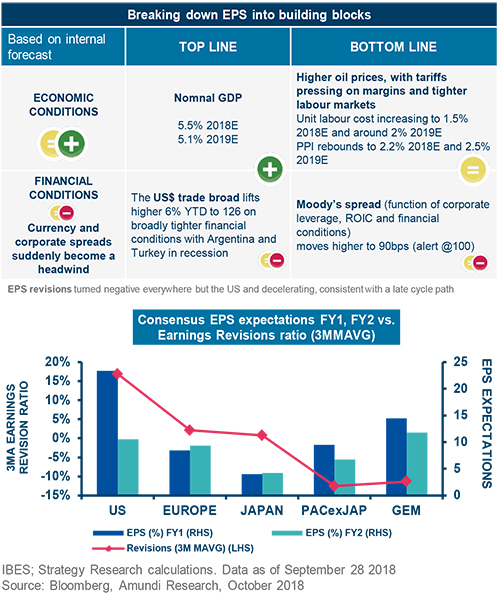 EPS growth, possibly one of the weakest in the world in 2018 (+6%), is due to accelerate to about 10% next year according to Ibes, slightly below the US. But the economic slowdown, already high margins and EMFX turmoil are serious headwinds. MSCI EMU is now trending down, below its declining 200-day moving average. The breath is extremely low approaching the level of Feb 2016. − Style/Size/Factors Prefer Quality, but beware valuation. Bottoming out of High Div (positive watch). The P/BV is rising from a very low level in parallel with a rise in RoE. Japanese companies’ leverage is also rising from a low level. The P/BV is still below average compared to the MSCI World. 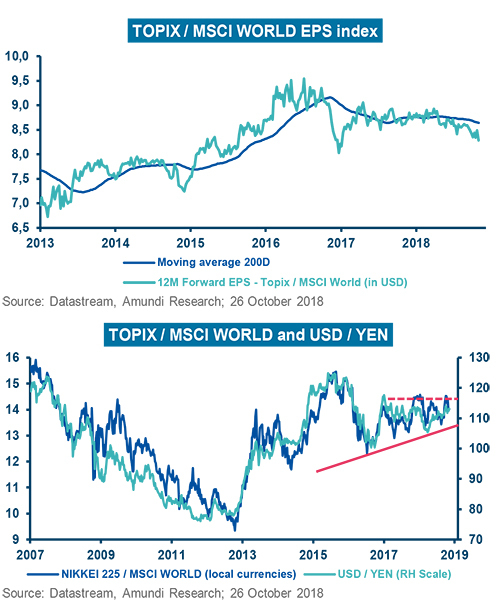 The relative position of the Topix vs. MSCI World, both in terms of the index and in terms of EPS, is rather neutral. Japanese earnings growth will fade to ca. 4% next year, according to Ibes. The relative performance very much depends on the Yen. As the trade war is far from ending, not sure that this cheap currency has a lot of room to depreciate much further. No clear preference at the moment. 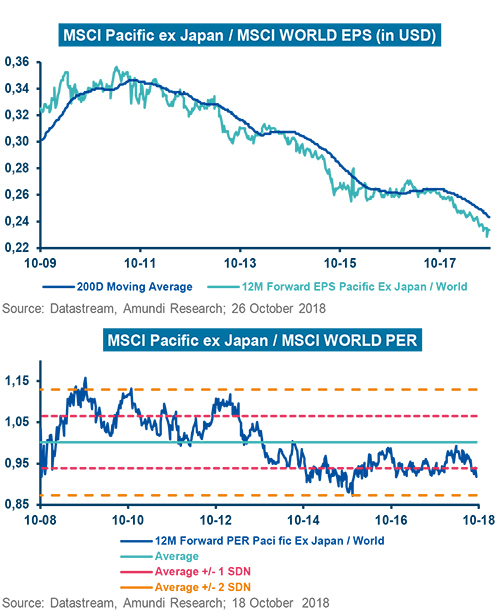 Pacific ex-Japan remains cheap with a relative PER to MSCI World at -1 standard deviation below average. The EPS trend is clearly negative vs. the MSCI World. Otherwise, Australia makes up 57% of the region and Hong Kong 29%. Hence, it is highly affected by China’s policy and its impact on industrial commodity prices and trade. A pro-infrastructure stimulus in China would help this regional market to bounce back, but the timing and sustainability of this movement are uncertain. A MSCI Pacific ex-Japan death cross is in place both in absolute and relative terms to the MSCI World. The deceleration in EPS growth has already been happening since the beginning of 2018. Revisions are decreasing. Taking into account the not brilliant scenario we have in mind in terms of global demand, EM exports and oil, GEM EPS is expected to decelerate further; our internal forecasts for 2019 are low single digit (+5%) and below IBES consensus (that is close to +12%). The cycle is mature and favours quality and dividend yield. Asia – China, the Philippines, Indonesia and, to some extent, India – show a good combination of supportive fundamentals, valuations and macroeconomic solidity. Indonesia’s external vulnerability is expected to remain a bit worrying. India, Indonesia and the Philippines should benefit also from lower oil prices. In Latam, Brazil and Peru are attractive. In Brazil’s case, fundamentals improved in terms of valuations, expected profitability and dividends but big uncertainties remain on the elections and on the reform agenda that will be implemented by the new leader. Protectionism and politics (geopolitics, reforms and elections for example in Brazil. Trade war tensions). Deceleration in global growth has to be monitored. Commodity prices: a strong rally could hurt Asia. 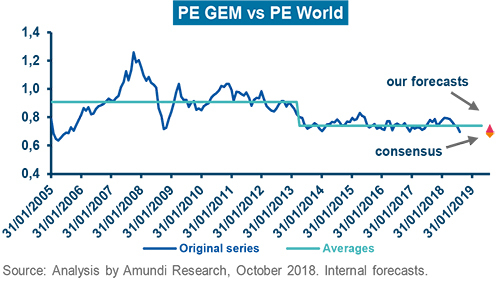 GEM not so cheap vs. World considering the expected earnings growth gap. Valuations look marginally negative on the EMBI index. In terms of EMBI spread, our target for the end of 2019 is close to 410 (currently 390). Further tightening expected for 2019 is justified by the less brilliant scenario in terms of global growth, by the growth differential between EM and DM turning in favour of DM (at least in H1 2019), by EM government debt and volatility increasing. 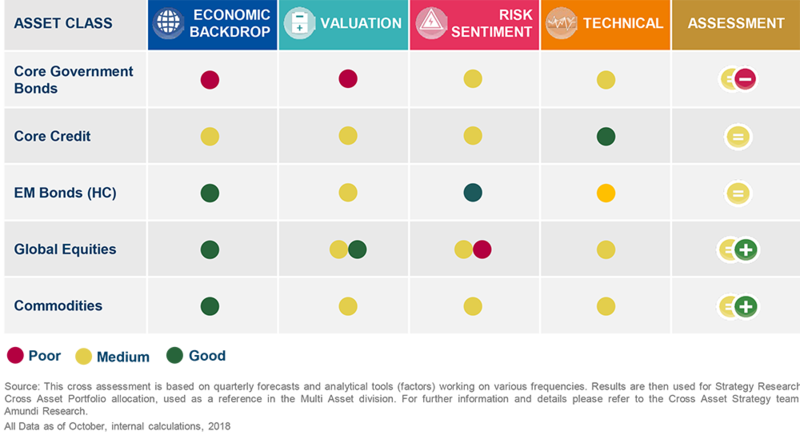 We prefer to be selective, favouring countries with strong fundamentals (low vulnerability), credible reform agendas, attractive valuations and risk adjusted carry. 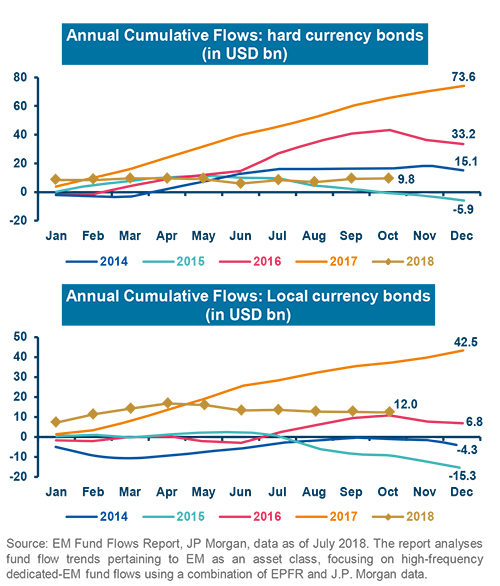 Sentiment: Outflows from HC EM bonds have been limited during 2018 but the environment is not supportive and many headwinds will remain. Valuations looks marginally negative on EMBI Index. Investors have remained in EM throughout the sell-off. Positioning is not too stretched. 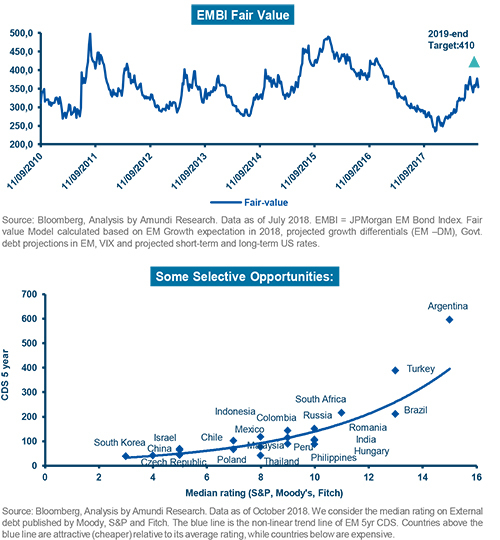 However, it will be difficult to see significant inflows into EM bonds in the coming months due to the lower risk-appetite of global investors. 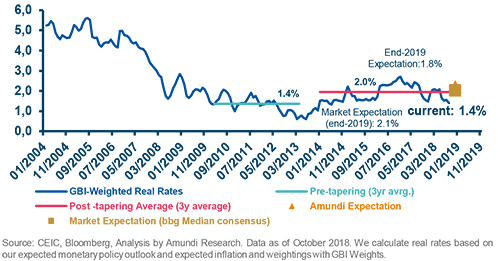 Real rates are expected to increase in 2019, remaining slightly lower than the post tapering average. EM central banks are in a tightening mood. We expect that inflation will remain almost always inside the central banks’ target range. Flows remained sticky during 2018 but have been showing some weakening signals in recent weeks. The negative sentiment vs. emerging markets has until now hit mainly EM FX and to a lesser extent equity. Some contagion effects to bonds can happen due to the headwinds on the asset class (tariffs, politics, idiosyncratic stories, US rate hikes, strong USD). As idiosyncratic country risks have risen. External vulnerability has to be strictly monitored. Geo-political risk events: Trade war tensions, idiosyncratic stories. 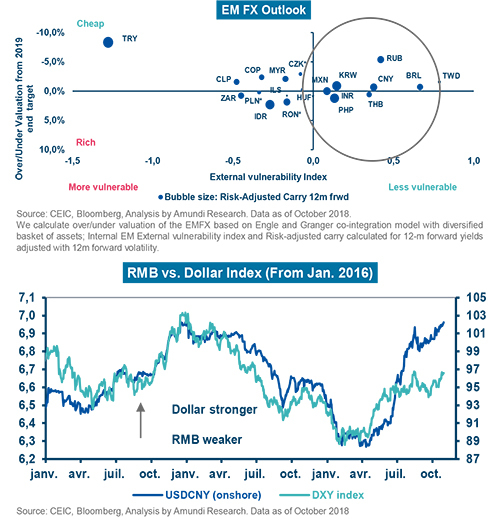 EM FX catalysed most of the investors’ worries regarding an environment that is not particularly supportive for emerging markets. 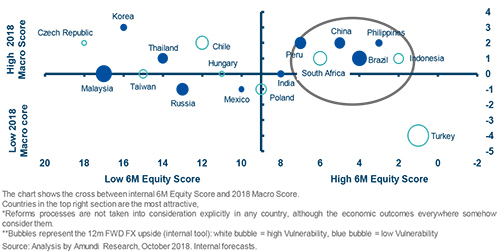 The external environment remains relatively carry friendly but geo-political risks will limit any further significant inflows into EM local currencies. Valuations remains slightly attractive on a 1 year horizon: USD will remain strong in the short term but the EM – DM growth differential will still move in favour of EM in the second half of 2019. Real rates are expected to increase, due to the tightening bias among EM Central banks. In terms of USD broad vs. EM FX we see a marginal appreciation of EM FX vs. USD mainly due to still undervalued MXN and to our view of appreciation of the CNY (in case of no trade war escalation). It will be very important to be selective among countries that show still supportive EM FX valuations. We will continue to prefer the high carry/low vol currencies with low external vulnerabilities and not excessive valuations. 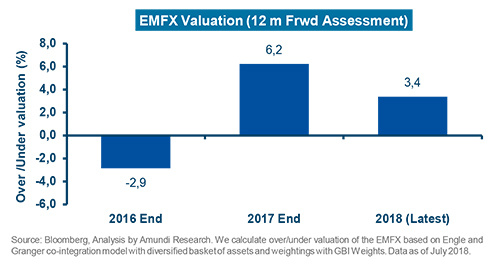 EMFX Outlook: Preference for high-carry with low volatility, less externally vulnerable and under/fairly valued Currencies. Performances of base metals and oil diverged quite significantly 2018 (oil outperformed the base metal index by more than 30%). This event is almost extraordinary even in a very volatile world like commodities; however there are some important and clear reasons for such this dislocation, most of them related to oil movement, and they will likely last until next year. Base metals suffer during dollar appreciation especially, with economic momentum deterioration driven by trade war concerns. In addition, the deceleration in overcapacity cuts for base metal producers did not help to underpin those commodities. US inventories are at their lowest level since 2015 and remain supportive for oil, and the risk is skewed to the upside. 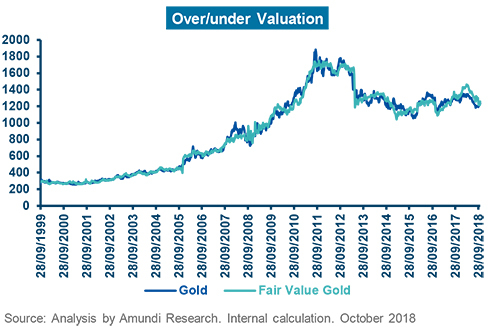 Gold still a cheap macro hedge as fair value remains above actual levels on weak dollar and accommodative monetary policies. The target is still $1350 at the end of 2019. 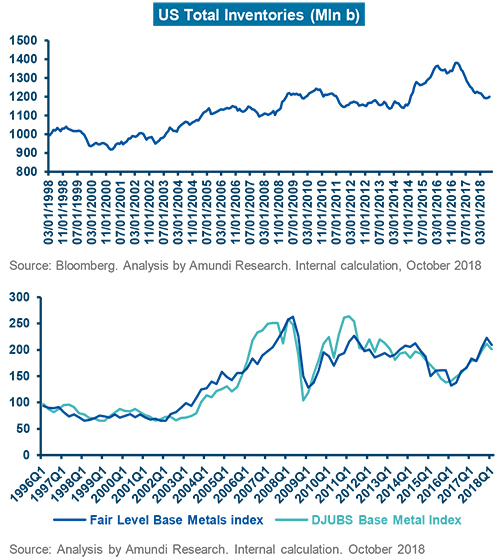 Base metals remain relatively cheap and they are not yet fully pricing in the economic fundamentals in terms of global growth. 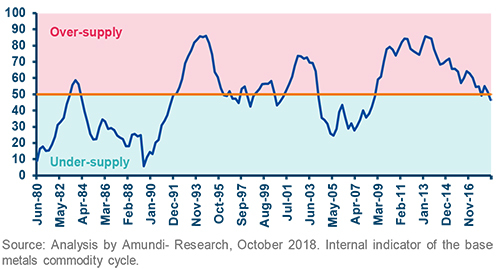 The most likely scenario going forward is still the late/mature cycle phase where risky assets historically deliver positive returns although with more volatility. 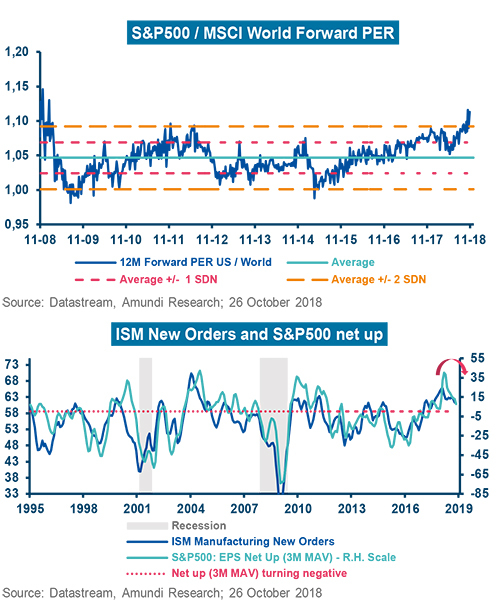 Despite global economic momentum has lost some grip the central macro scenario is still driving profits higher and they should move close to the peak of this cycle. From a pure economic point of view the major concern is still related to the potentially negative consequence from trade restrictions. Having said that according to our fair value there still some room for an upside going forward, mainly in laggard regions like Europe and emerging. Even if recession is not likely in the year and in the near term global financial conditions remain generally accommodative, the picture has been deteriorated in the latest months and strong dollar and higher US interest rates drained liquidity deteriorating somehow the risk sentiment. 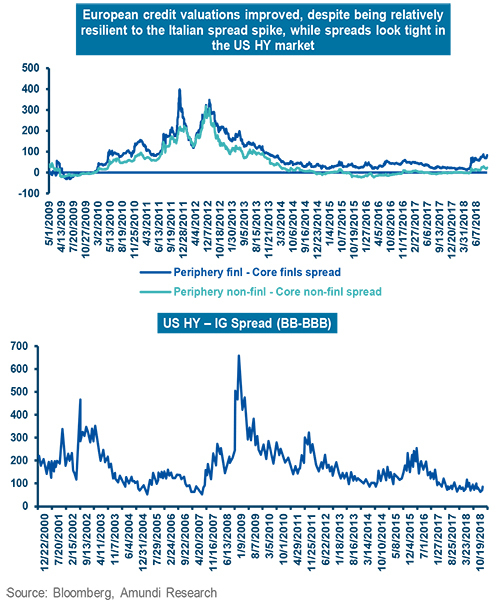 Credit spreads and fundamentals are the key variables in understanding potential triggers for a structural change in risky assets. Mounting geopolitical risks could materially dampen the base scenario. Points to a late cycle financial phase, which is usually good for equities, as long as the (EPS) cycle is intact. 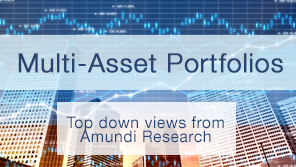 This document includes Amundi’s view on asset returns used to build reference portfolios for our institutional clients. The edition published in February covers major macro and financial foundations, while on a quarterly basis it will provide table updates. 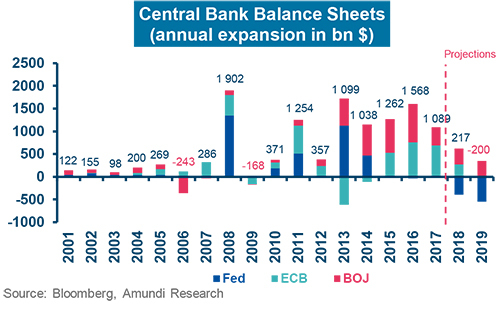 Central banks’ “beautiful” normalisation of balance sheets and rates will drive the transition from a reflationary into a late financial cycle regime against a backdrop of consolidating growth (from both a macro and micro fundamental standpoint) and subdued inflation.